The first time I visited High Society Tacoma, they showed off their houses brand. American Sensi Garden is $30/gram and $15/halfgram. After that visit, I smoked out with one of the managers and we both bought American Sensi Garden concentrates. This one's great, as you'll see, but honestly the other variety was even better! With a bright orange color and a glistening surface, this concentrate looks terpy! It's powered by WeedBunny, known for their solid extractions. Partially a crumbly sugarwax and partly a terpy wax, this stuff looks great. It's got the aroma of a ghost of an orange, over traditional 710 aroma and a nice skunkiness. The bottom is a rich floral with a sweet edge. This melts well, and the flavor is bright with orange notes and a clean center. This ends with a heavy tangerine flavor and flower tone on the tongue. There's a bit of a bite at the end that the other one definitely did not have. High on this was rapid and right to the head! This is dope, everything about this was potent. Fogginess takes over with a real sit back, kick back kind of feel tied with giggles, more headiness, and a smooth end. Overall, I look forward to big things coming out of the American Sensi Garden - a family-owned, local business with, as I hear, deep roots in the industry. I hope to find out more - I didn't even touch base about how unassuming this packaging currently is. Check in at High Society way early, from 8am to 11am and mention Cannahour for 5% off! Can not tell you how much I appreciate you words. 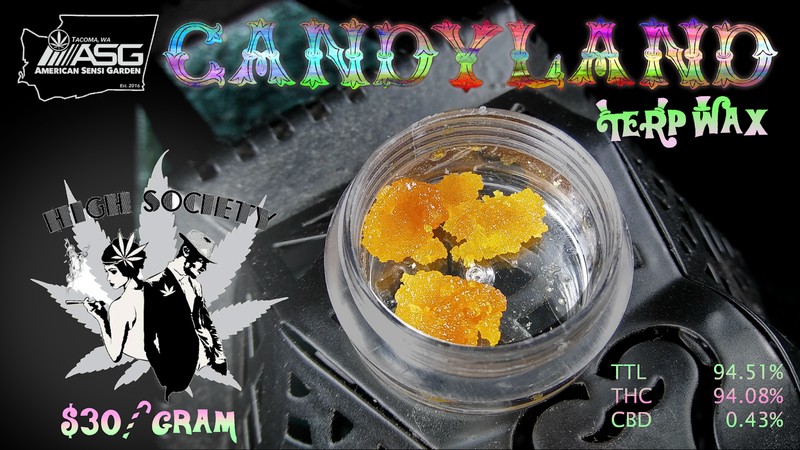 Yes I agree the Gg#4 Terp Wax is superior to this amazing Candyland Wax! Honestly, you'll need to try our Green Crack Terp Wax which will be in house at High Society Tacoma next week, as it's the tastiest of all our waxes.. Right on! I appreciate your great product, keep up the good work. I'll definitely be up at High Society Tacoma next week, and for sure will pick it up as Green Crack is favorite strain.